The US president's aircraft was spotted by an aviation enthusiast as it flew over the UK on its secret trip to visit troops in Iraq. 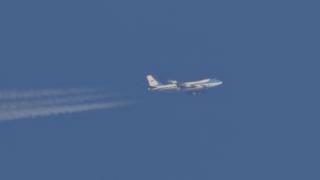 Alan Meloy photographed Air Force One in the skies above Sheffield on 26 December. The plane carrying Donald Trump and the First Lady left Washington in total secrecy in the dead of night. After Mr Meloy's picture was shared on social media people began to track the flight online. Mr Meloy said he was "amazed" at the response to his photograph, which has seen him contacted by three US TV networks. He said he captured the image purely by chance as he photographed aircraft from the front step of his house.